There is no resolution from last week. 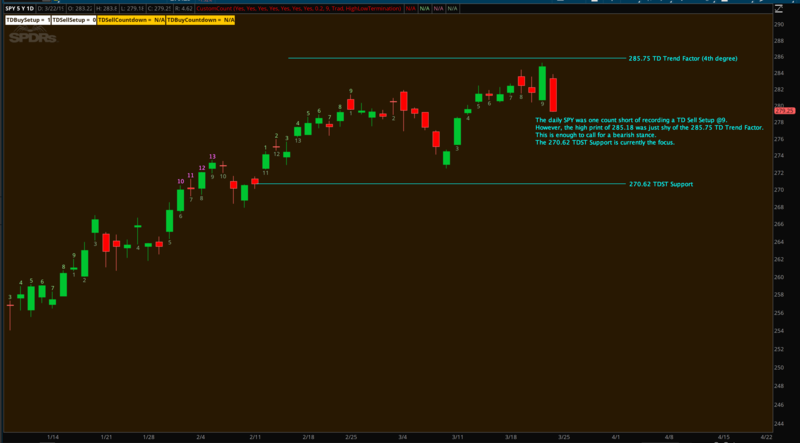 The same levels drawn from last week still applies to the S&P 500 (SPX) and the ETF equivalent, SPY. 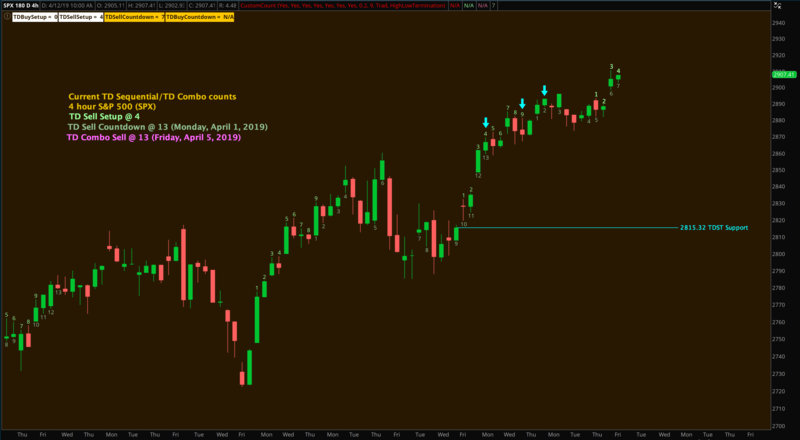 One item does stand out is candlestick bearish engulfing pattern recorded last Wednesday, April 17. Of all the candlestick patterns, the engulfing pattern is probably the most reliable. In that context, the SPY should evolve lower. In the event the market continues to melt higher, the TD Risk levels are still valid at 290.45 for the daily and 292.34 for the weekly. 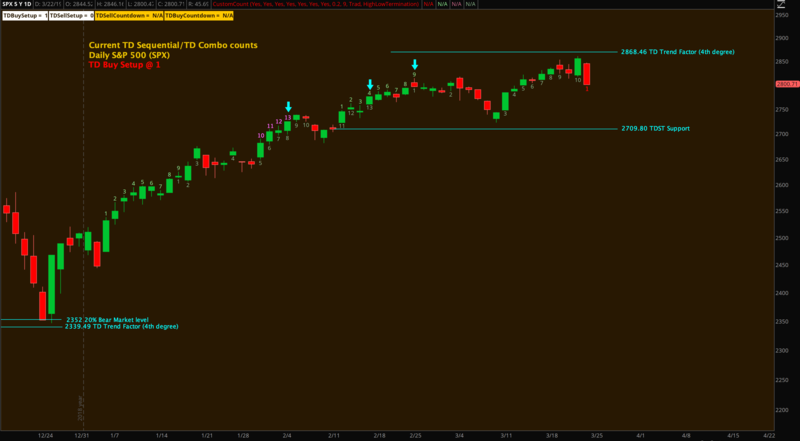 One more chart for the Nasdaq ETF, QQQ. 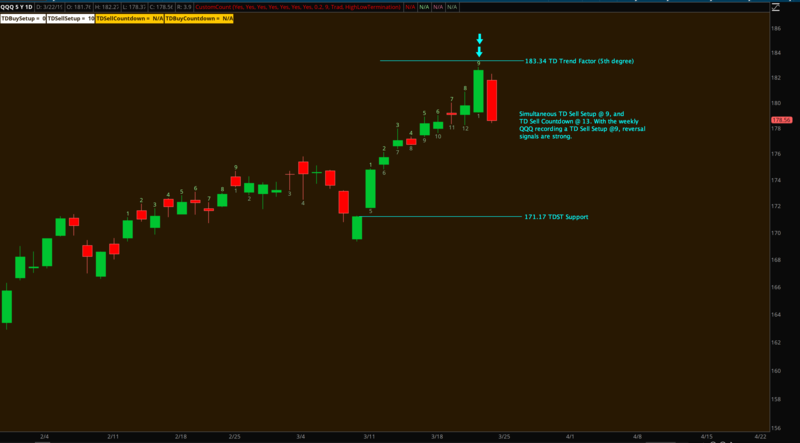 While the SPY took a sideways path, the QQQ took bullish path after a mild rejection from the TD Trend Factor at 183.34. Currently, it is at/near price exhaustion. 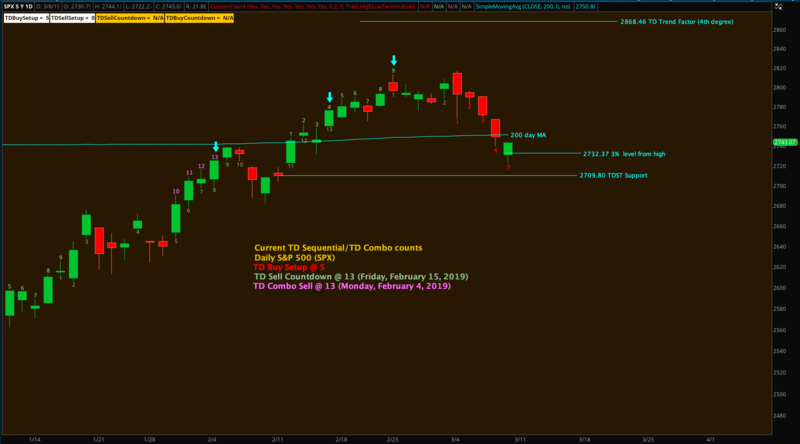 A pullback looks imminent and will be gauged against the 178.31 TDST Support level to determine the degree of weakness. 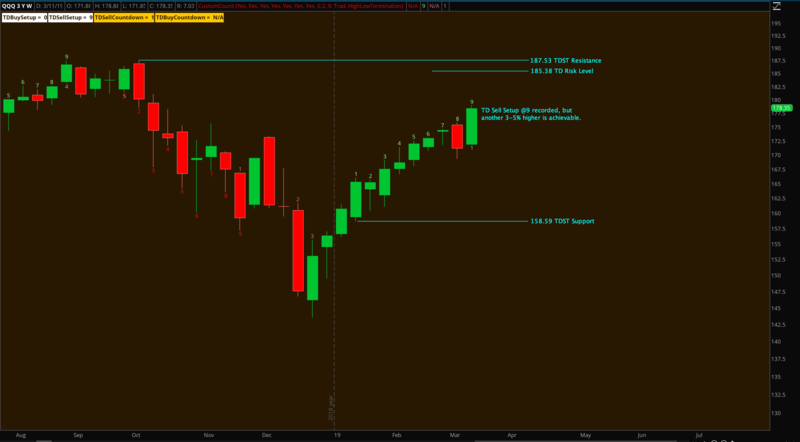 Equities are showing continued strength, but remain in the area of price exhaustion per the weekly charts. 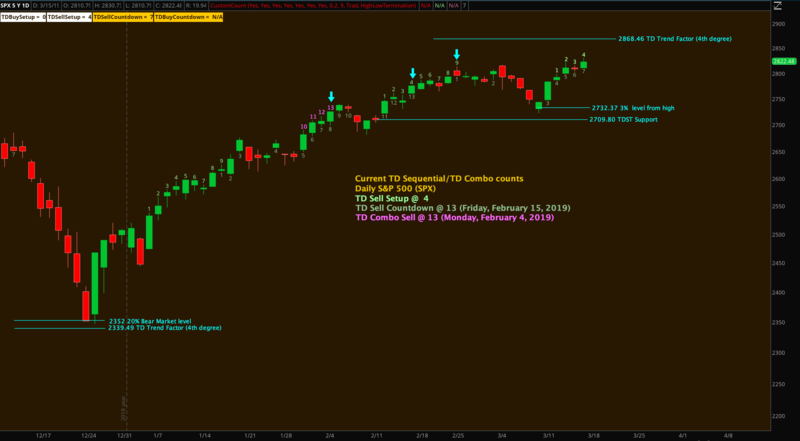 The daily S&P 500 ETF (SPY) recorded a TD Sell Countdown @13 and TD Sell Countdown @13 in the vicinity of the 285.75 TD Trend Factor last week. 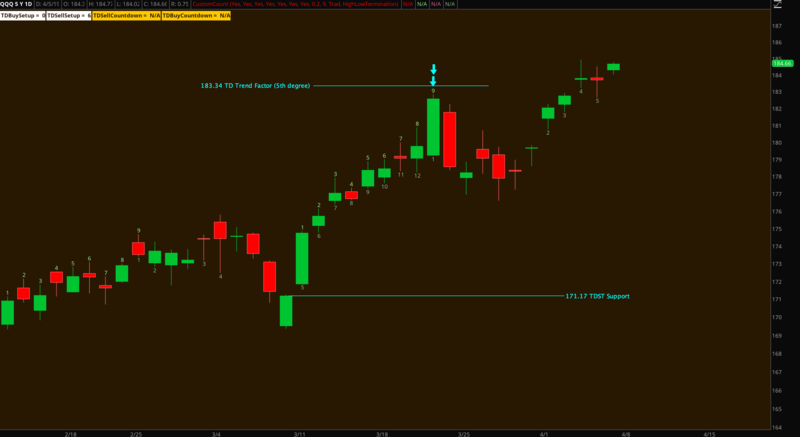 That was the ideal reversal point. With the SPY showing a renewed liquidity push higher, the next area of price exhaustion comes when the active TD Sell Setup should be able to record an ‘8’ count on Monday and a ‘9’ count on Tuesday. 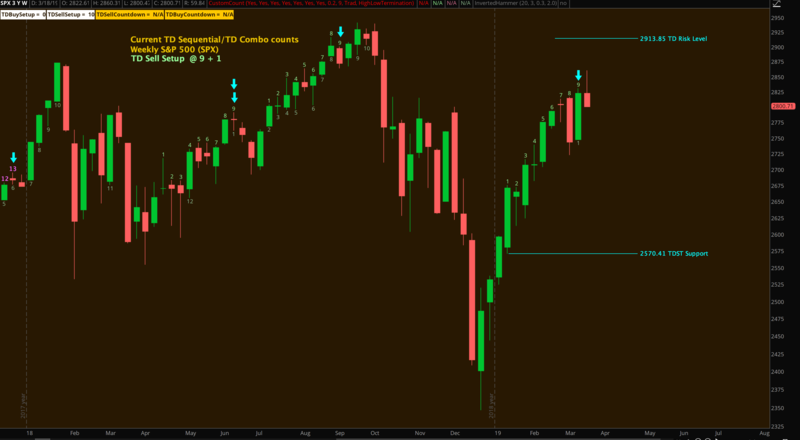 The S&P 500 (SPX) is in an identical spot. 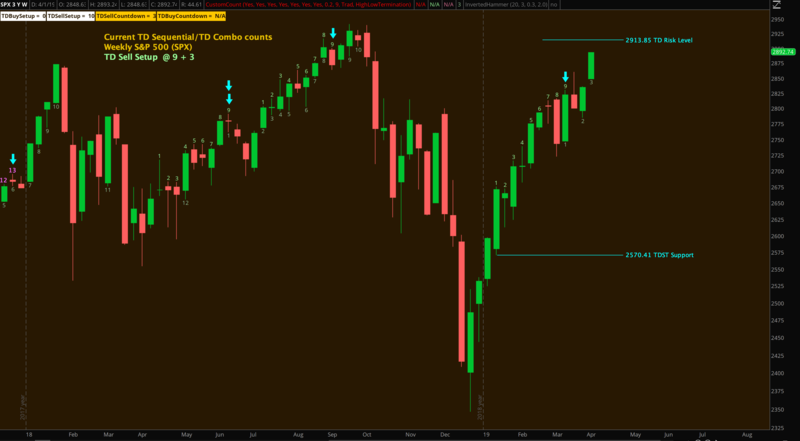 For the Nasdaq ETF, QQQ, a TD Sell Setup @8 or @9, is set to record on Tuesday and Wednesday respectively. 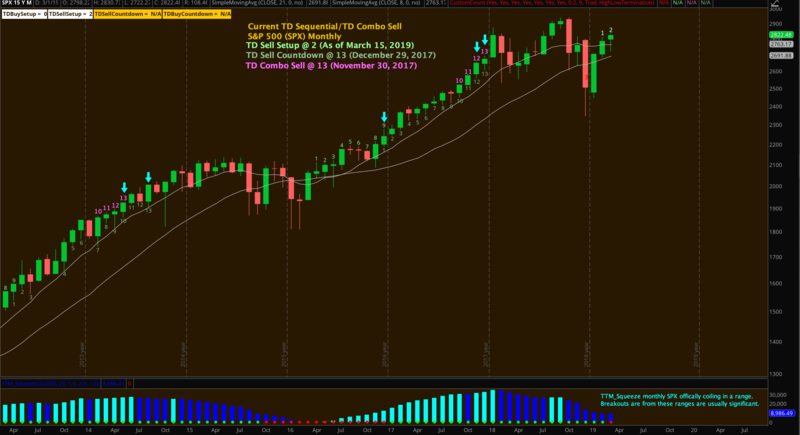 While the ideal reversal point was last week, it is difficult to begin any long participation until there is a proper pullback. 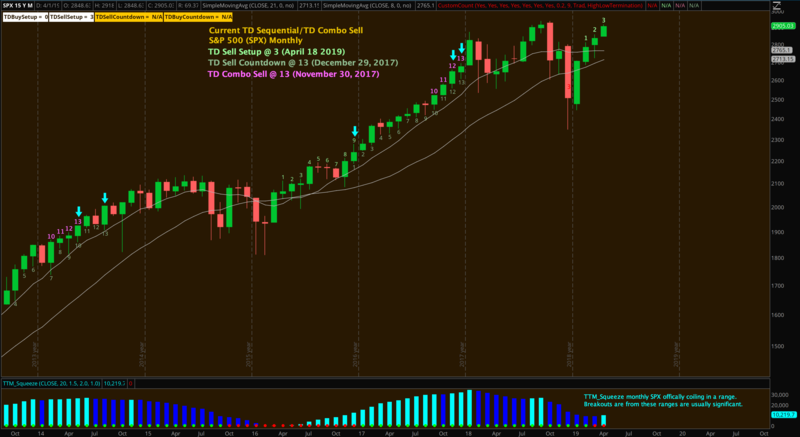 The S&P 500 (SPX) has become non-committal to push lower since the yield curve inversion a couple weeks back. 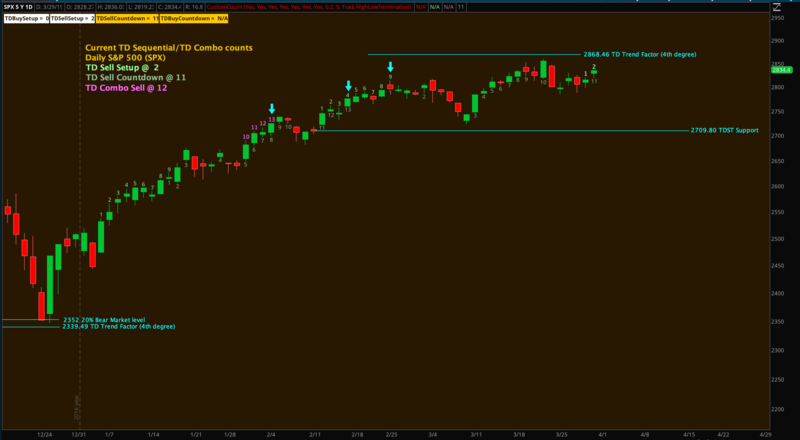 Short term, the SPX is currently locked in a range. 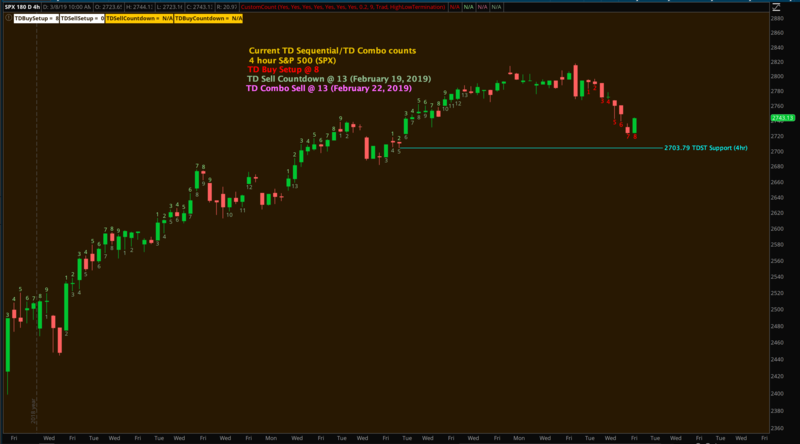 The top of the range can be completed during Monday’s session as the two hour SPX is looking to record a TD Sell Setup @9 in the first couple hours of trading. 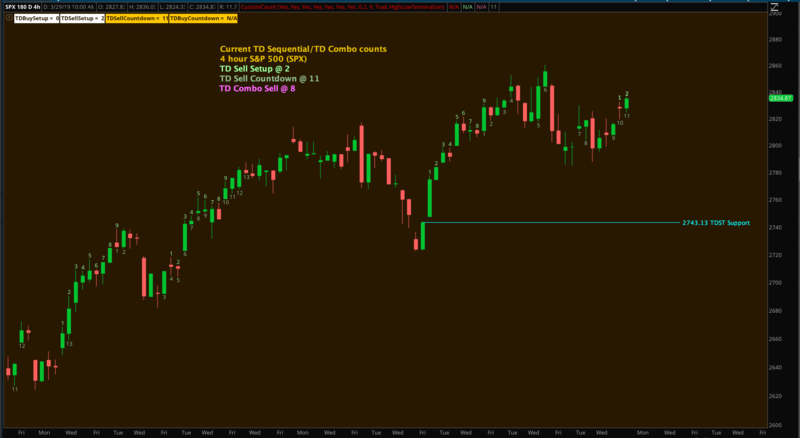 If the 9 count is recorded, then the lower boundary of the range is quantified with TDST Support at 2798.72. 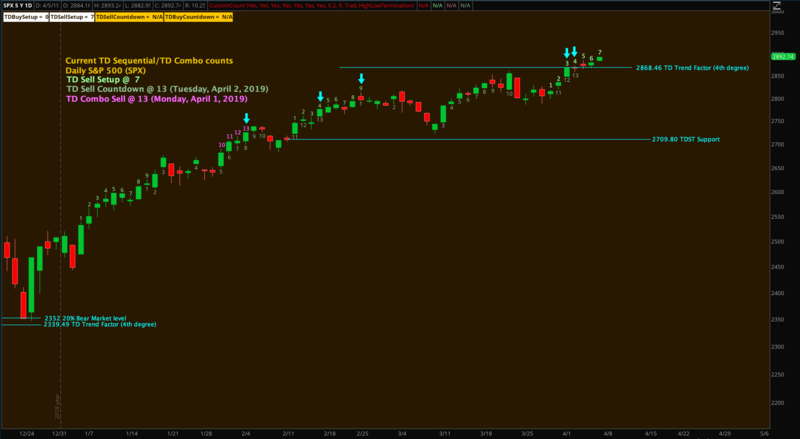 Also from the chart above, previous price exhaustion points were shaded grey for reference. Focusing out to the week, there is plenty of market sensitive data coming out. The ISM Manufacturing and jobs report are front and center. Potential breakthroughs or disappointments from the ongoing US/China trade talks are also catalysts. 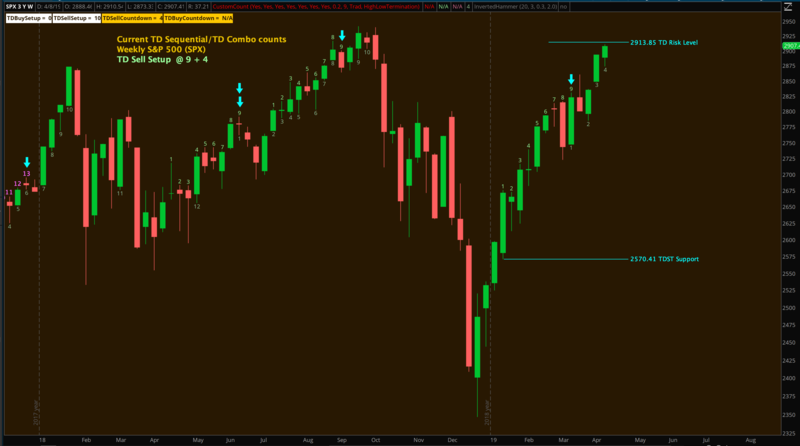 Since the market has not established a bearish reversal yet, note the daily SPX has an active TD Sell Countdown @ 11, that is nearly complete. The weekly charts are at price exhaustion territory. 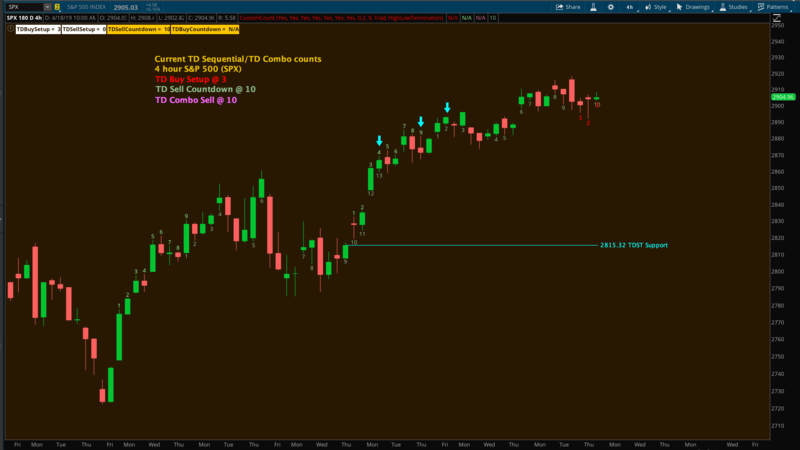 Bearish if SPX closes below 2818.46 at the close of Monday, April 1, 2019. Everything is coming into place for another volatility phase. 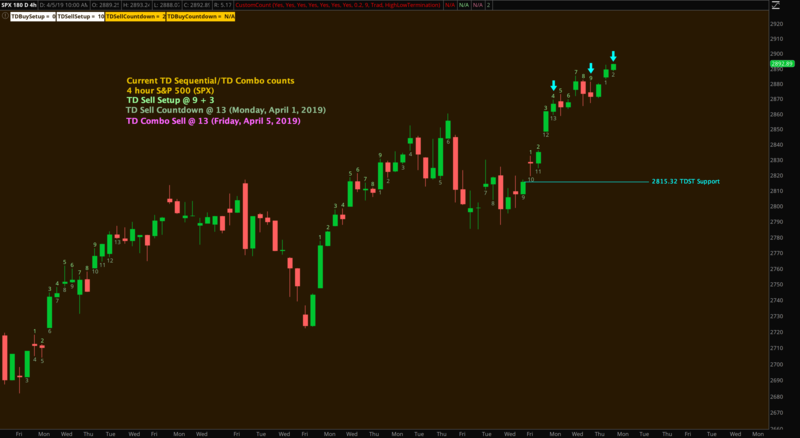 Looking at the S&P 500 ETF (SPY), the daily chart couldn’t quite record the final TD Sell Setup 9 count last Friday, but it did brush against the 285.75 TD Trend Factor. 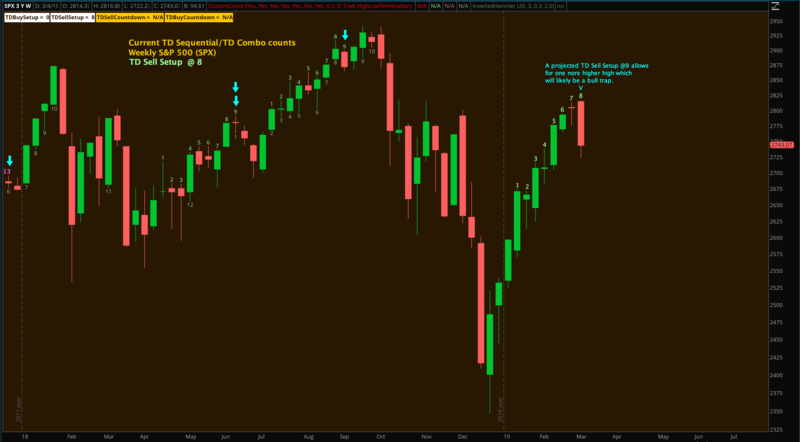 The Nasdaq ETF (QQQ) last Thursday did record a TD Sell Setup @9 and a TD Sell Countdown @ 13. 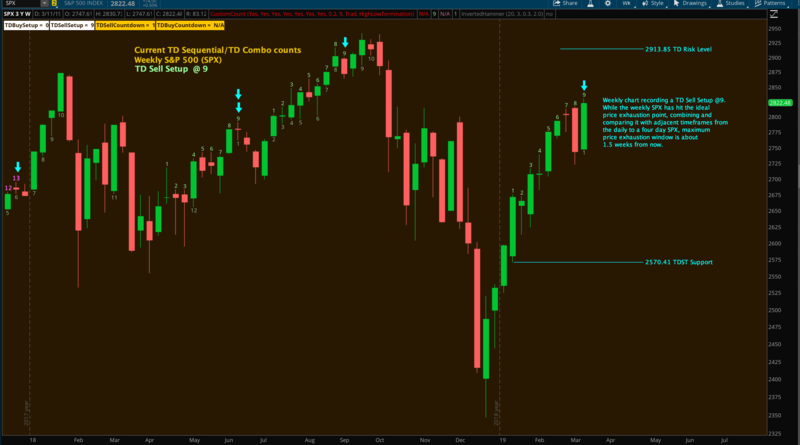 Considering the weekly SPY and QQQ both recorded a TD Sell Setup @9 last week, expectations are high for a deeper retracement beyond the 3% standard. 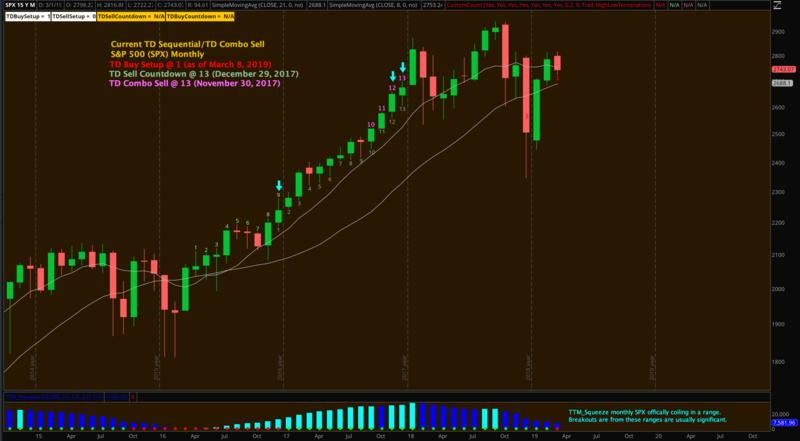 It’s also quite possible the indices can see a proper retest of the lows made back in December 2018. Before we get to that point, the next test is to see how the indices handle their respective TDST Support levels at various timeframes. For the S&P 500 (SPX), the SPX needs to trade above 2808.71 in the first two hours of the open on Monday to give some edge to the bulls. If not successful, the four hour SPX TDST Support at 2743.13 is the level of focus and ultimately the daily SPX TDST Support at 2709.80. 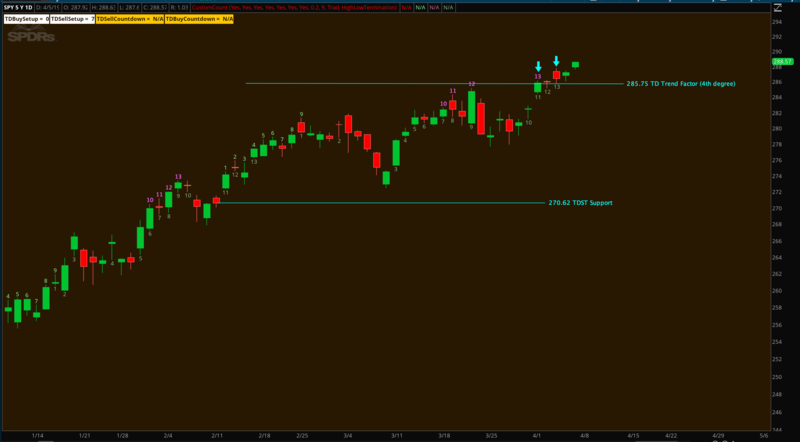 For further reference, the daily TDST Support for the SPY is at 270.62, and 171.17 for the QQQ. Equities are continuing to expand higher. 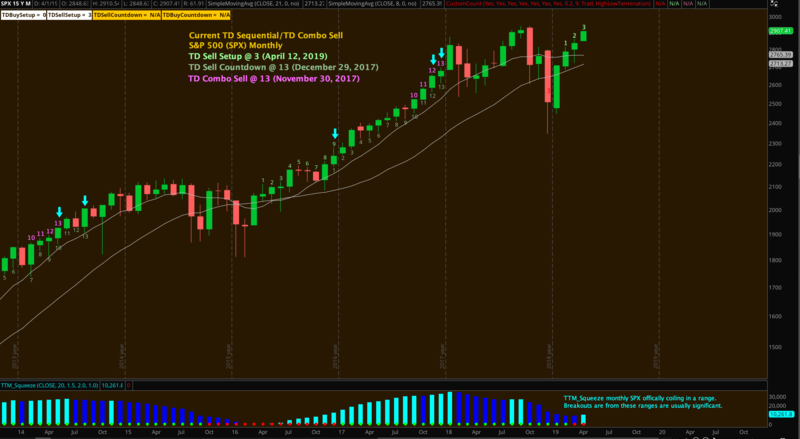 Currently many index and sector weekly charts are showing TD Sell Setups @9. For example, the Invesco Nasdaq related ETF (QQQ) above recently has taken over leadership duties and has recorded a TD Sell Setup @9. 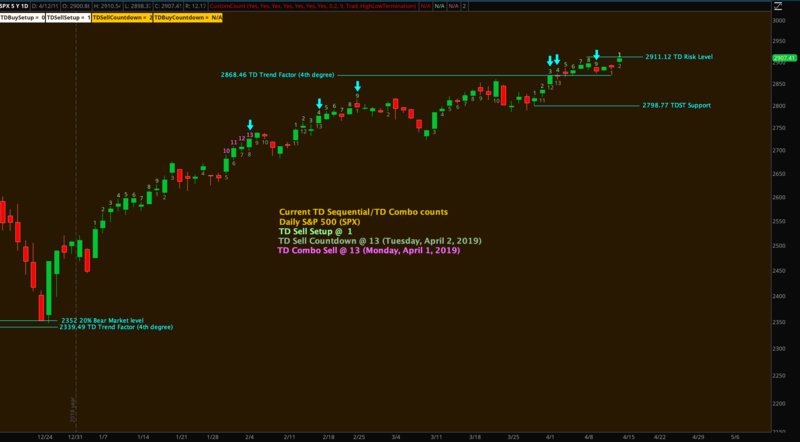 The iShares Russell 2000 ETF (IWM) also recorded a TD Sell Setup @9, but it is lagging, and that should be of some concern. 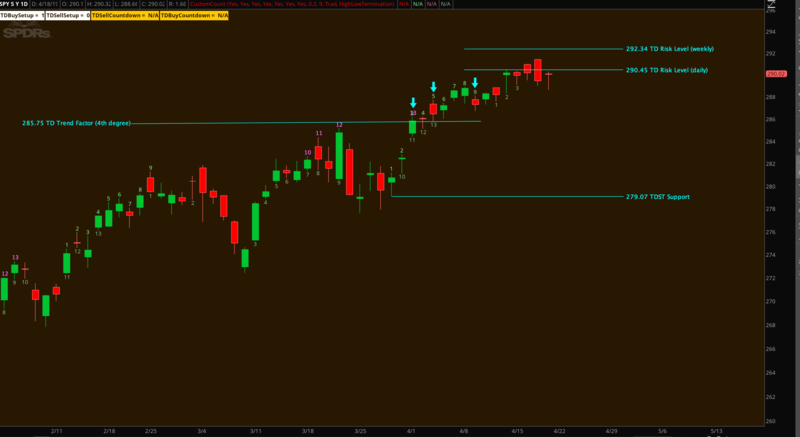 Between the QQQ and the IWM, there is evidence the V rally should start stalling. For many indices, weekly charts are in price exhaustion territory, and daily charts show more upside is possible, a narrative is drawn to satisfy both scenarios. 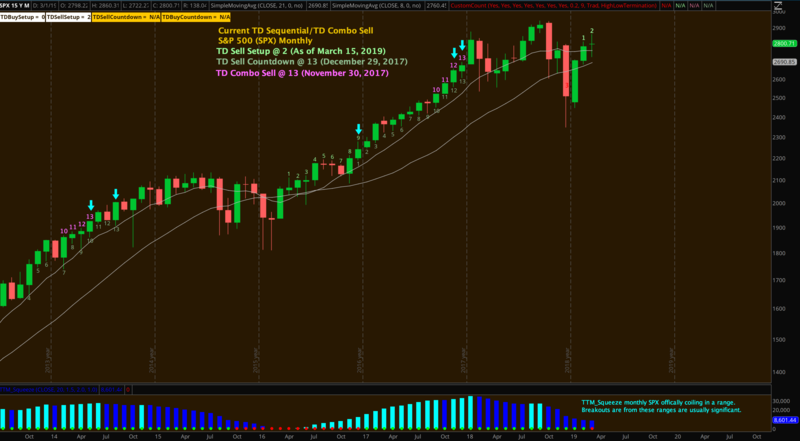 The top narrative shows the S&P 500 (SPX ) and the related indices push higher for another 1-3 weeks. 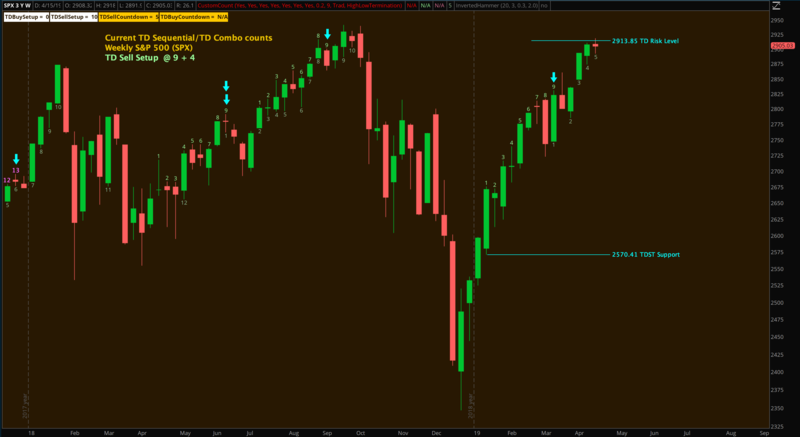 To hone in on a specific date, daily charts are the default. 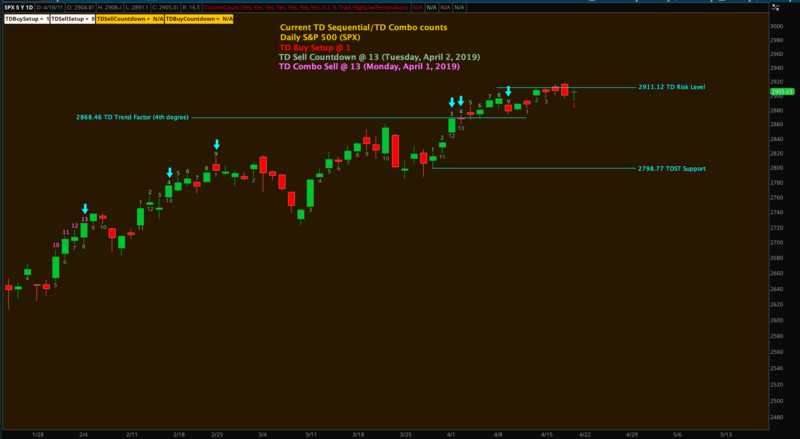 The daily SPX is converging on a TD Sell Setup @9 along with TD Sell Countdown @ 13 around late this week into the following week, keeping note of the relationship with the active 2868.46 TD Trend Factor. The ideal scenario is to have the daily charts record qualified TD Sell Setups or TD Sell Countdowns while the weekly charts trade under their respective TD Risk Levels. 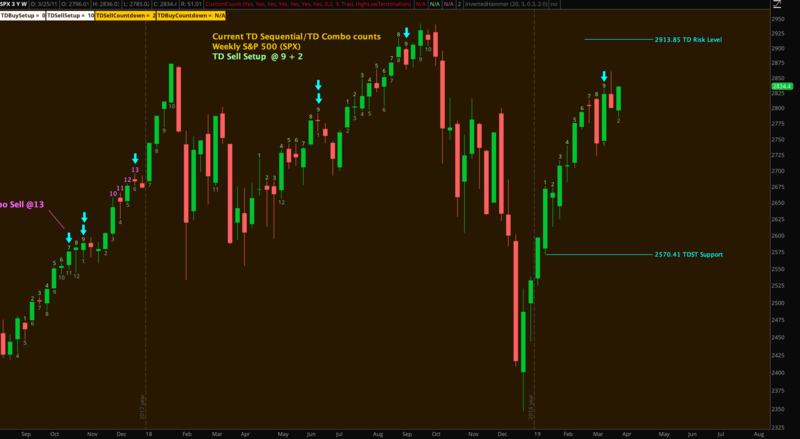 This narrative stays intact as long as the SPX TD Sell Setup stays active. 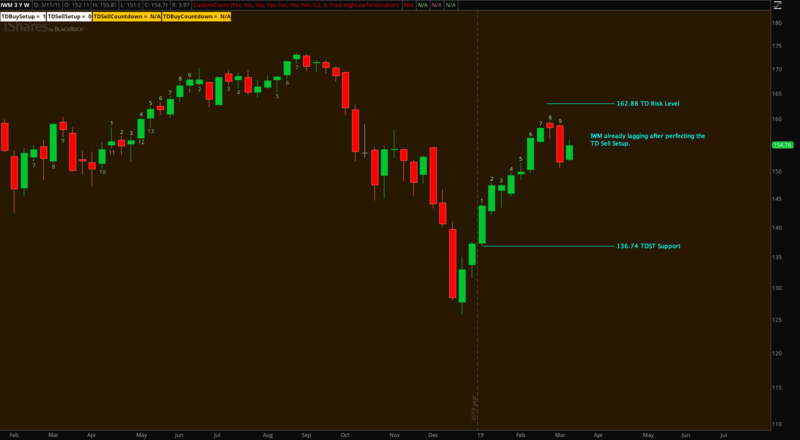 It’s considered a soft warning sign if there is a bearish price flip on the daily SPX this week. 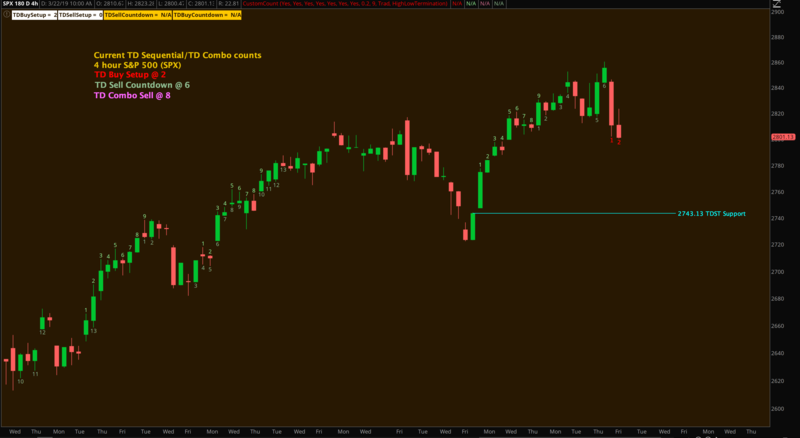 A new bearish narrative needs to be drawn if the four hour SPX chart breaks below the 2743.13 TDST Support level. As of last Friday’s price action, there was buying pressure in the last hour of the S&P 500 (SPX) that looked promising for at least a near term reversal. 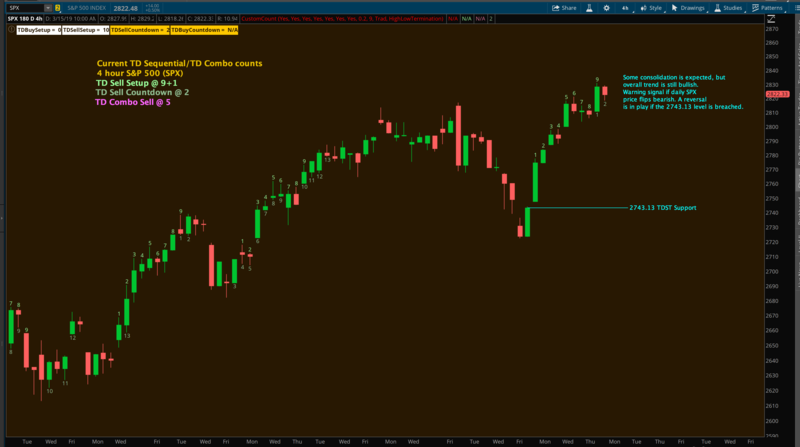 Utilizing the S&P 500 SPDR ETF (SPY) four hour chart above, the four hour SPY timeframe recorded a TD Buy Setup @8 above the 270.03 TDST Support level (2703.79 SPX equivalent) to support the reversal. Furthermore, the two hour SPY recorded a TD Buy Setup @ 9 at Thursday’s close and held the TD Risk Level at 272.17 (2720.48 SPX equivalent). 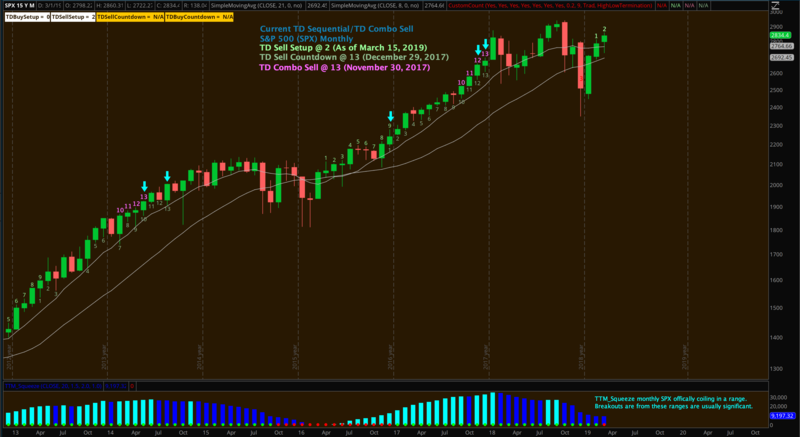 Couple that with the four hour timeframe, there is good risk reward for the market to head higher. 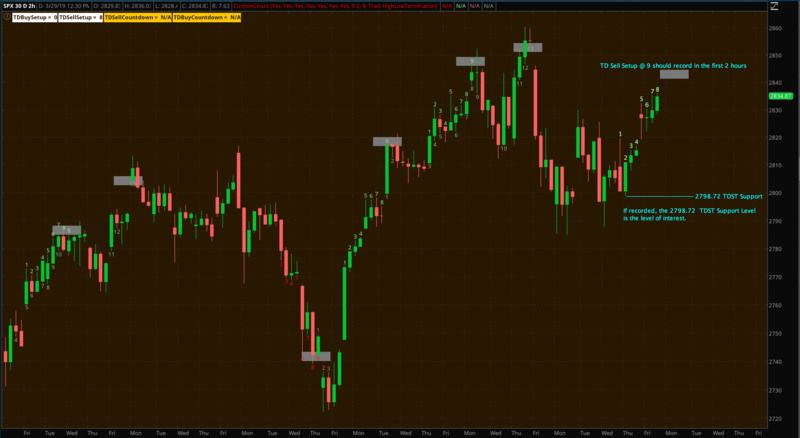 For the week ahead, keep the focus on the four hour SPY. 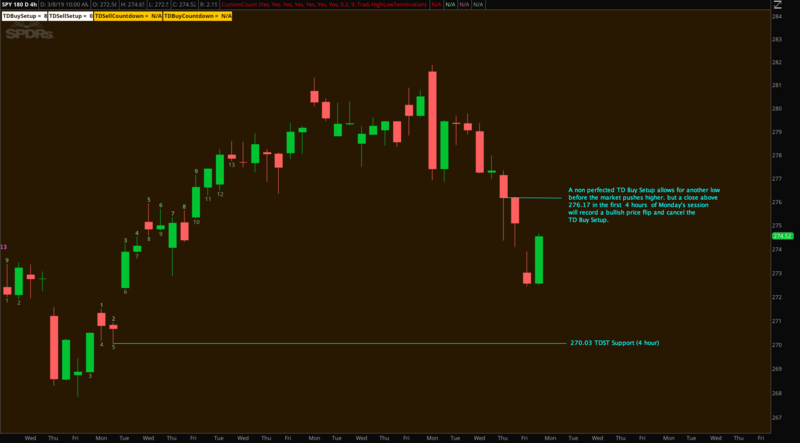 Despite the promising short term reversal, the SPY has an unperfected TD Buy Setup and can record a lower low. 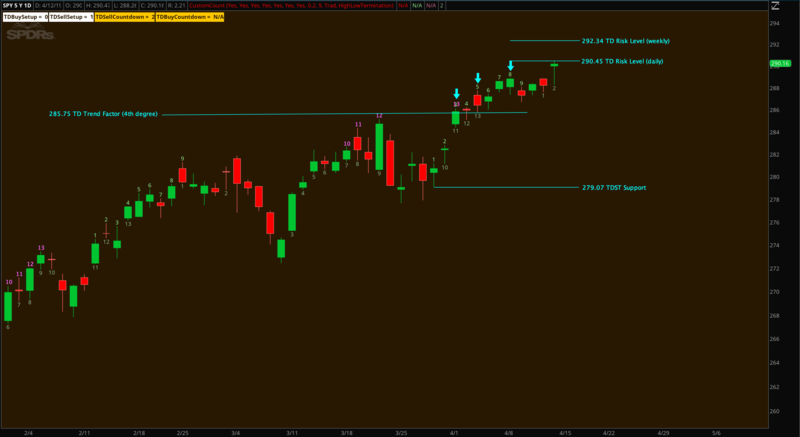 But as long as 270.03 holds, the bullish short term picture looks bright. For the remainder to the week, there are still downside risks, and to mitigate those risks, the SPY needs to record a price flip on the daily chart before it records a TD Buy Setup @9 – preferably by Tuesday’s close. Going further out to next week, if the bullish campaign is uber successful, and achieves another higher high on the weekly chart, a TD Buy Setup @9 will be recorded and sets up a bull trap for a larger degree selloff.